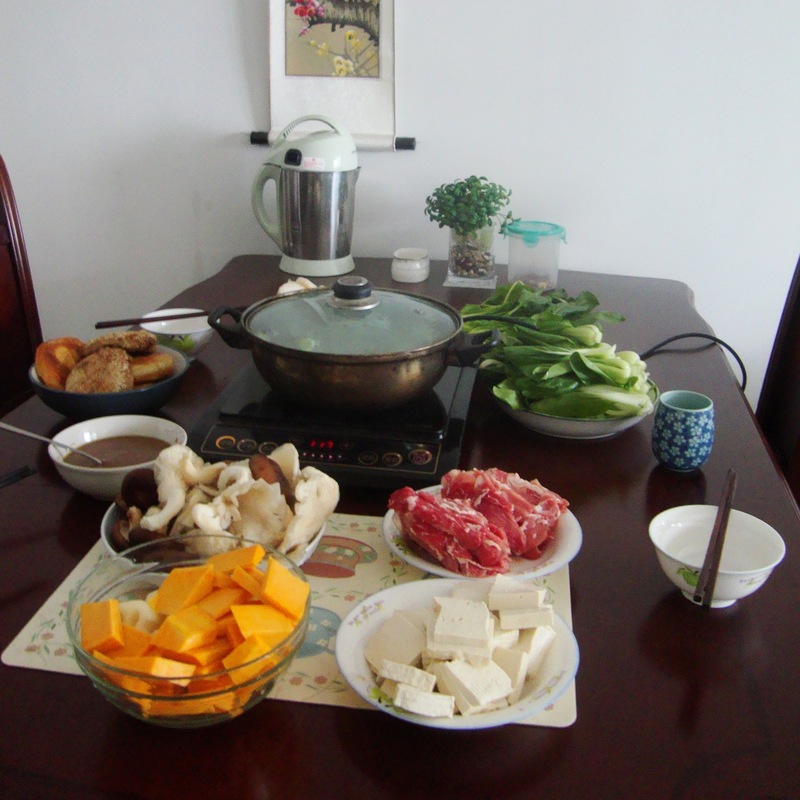 Hot pot (火锅, huo guo, which literally means “fire pot” in Chinese) is a Chinese favorite. Hot pot restaurants can be found everywhere in China, as ubiquitous as homestyle restaurants and roadside barbecue stands. They are usually packed, and if you’re not eating it in a restaurant, you’re probably eating it at home. It’s convenient, it’s delicious, it’s healthy, it’s fresh, and there’s all sorts of room for creativity. Different regions have their own version of it: uber-spicy mala (麻辣) hot pot from Chongqing/Sichuan; Yunnan mushroom hot pot; traditional Beijing-style hot pot with a coal stack and clear broth; some kind of nasty fish hot pot, where you eat all the fish before cooking anything in it; Guangdong-style seafood hot pot; mutton hot pot. Haidilao* (海底捞火锅), perhaps the most popular hot pot restaurant at the moment among both Chinese and foreigners, is designed to impress, with a variety of broths and dipping sauces to choose from, as well as chefs that prepare noodles fresh in front of you. Fast food-style hot pot restaurant chains, such as Xiabu Xiabu and Little Sheep, have also cropped up, where patrons order their own small pot of broth and a few meat and vegetables. In Beijing, one of our friends, who is from Chongqing, swears by Yang Jia Hot Pot (杨家火锅), an independent and wildly popular shop run by another Chongqing native. When I was younger, we would often eat hot pot in the winter — a pot of stew cooking at the dinner table really is good at warming you up. For some reason, I never really appreciated it until I came to China. But even though foreigners love to eat it here, hot pot still hasn’t seemed to catch on in the West. Hopefully, as Chinese hot pot restaurants expand overseas, the rest of the world will learn to love it too. On another note, my right eye had been acting strange all day. It was producing eye gunk like crazy and my vision kept going blurry, and by evening, it had started to turn noticeably red. I thought I was getting another eye infection, of the variety that caused me to go to the hospital a few years ago. Luckily I still had some of the medicine I had used. But on my way home from Tongzhou, another friend called and asked if I wanted to check out this new bar/barbecue joint that was offering free beer. Perhaps foolishly, I went along for a quick two pints, then headed home to take care of my eye. But on the way, I noticed it was no longer feeling so weird, and when I got home, whatever was going on seemed to have cleared up. Now, I’m not a doctor of medicine, or of anything else for that matter, but I’m attributing the healing to the alcohol**. * Haidilao is coming to America. ** Disclaimer: I do not recommend this “remedy” to anyone else, for eye infections or any other medical issue.